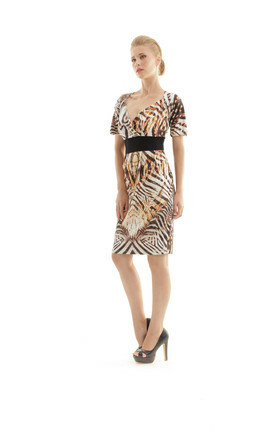 A lively animal print crossover top dress creates a sleek, flattering silhouette rendered in smooth stretch fabric for a look of smart sophistication from Conquista. A wide solid colour contrast fabric waistband adds figure slimming definition. V neckline and short sleeves. Cap detail at the shoulders. Model shown is 178cm and is wearing size 36/S.